This summer has brought a lot of kitchen time–fulfilling me with the joy of creativity and sensory stimulation from the smells, colors and textures of my creations. An addition to my business that I had not anticipated but am thoroughly enjoying is the opportunity of cooking for my clients. 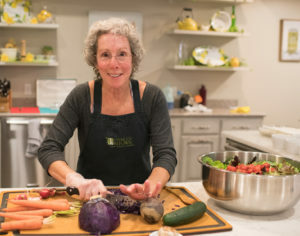 I have shared quinoa casseroles, grilled veggies, fruit cobblers, all sorts of greens in various combination and styles, soups, pastas and sauces…basically, the dinners I’ve been making each night have been doubled in size, with the leftovers being shared. I enjoy seeing my clients try new flavors, textures, and combinations of grains and greens to entice and familiarize them with eating REAL food. It’s working well! One client, a very busy woman who commutes several days a week for work and whose work often comes home with her in the evening, has been challenged time management-wise to find kitchen time to create healthy, energy producing and sustaining meals for her long days away from home. We’ve shopped together so she became acquainted with pantry staples, created strategies for prep-ahead techniques, all with a focus on healthy, quick meals and snacks that could be eaten throughout the week. Banana muffins, using this recipe, are a delicious, healthy mid-morning snack. With a smear of good quality peanut or almond butter, you’ve got protein, fat, and carbs that will last a few hours, giving you energy and stamina, as well as a smile on your face because they taste so heavenly. Enjoy! 1. Cream butter and sugar until it’s as smooth as it looks like it’s going to get. It will still seem a bit lumpy. No worries. 2. Mix in the eggs. 3. Add vanilla and bananas. 4. Sift together flour and baking soda into a separate bowl. 5. Alternately add the dry sifted mixture with the yogurt into the butter/sugar mixture. 6. Pour into 24 cupcake tins (with paper liners). Bake at 350 for 25 – 30 minutes, until they are a gorgeous golden color on top and a toothpick inserted into the center pulls back clean. 7. Once cool, I freeze most of the muffins in a giant zip lock baggie so I can pull them out one or two at a time. They thaw in a half-hour or in the microwave for 30 seconds. Smear with peanut or almond butter, and you’ve got a fabulous tasting and very healthy snack filled with protein, good fat, and energy-producing carbs! Yum.